As a fan of the original ECW, there are few wrestlers I want to dislike more than Bobby Lashley. And for years, Lashley made it very easy to dislike him whether he was pushed as a face or a heel in WWE or TNA. Bobby Lashley was what is known in pro wrestling as a “body guy”. Someone whose success in pro wrestling is entirely dependent on the fact that they are or look like a body builder. Lashley’s run in WWE from 2005-2007 was the textbook definition of the WWE using their marketing machine to try to force fans to like a body guy with no charisma, no mic skills, and a mediocre at best level of technical wrestling skill. Why as an ECW fan did I intensely dislike Lashley? Because body guys are antithesis of what ECW is all about, and when ECW was revived in 2006, at their second and final pay per view event, Lashley was chosen over CM Punk to win the only ECW Elimination Chamber match to become ECW Champion. Lashley then co main evented WrestleMania with the ECW Title around his waste and to this day, a generation of wrestling fans associate a body guy as the face of ECW. Sigh, thanks Vince. Flash forward seven years later, and Lashley can only be classified as strictly a body guy by fervent haters of him and TNA Wrestling where he is (as of this writing) their World Heavyweight Champion. Why can Lashley no longer be classified as just a body guy? After all he still looks like a walking commercial for anabolic steroids. Because after his run in the WWE and after his first run in TNA, Bobby Lashley went out and became the second most legitimate pro wrestling to mixed martial arts crossover in history. Second to only Brock Lesnar. Lashley has had 3 times as many fights as Lesnar had, though no one would argue Lashley has faced nearly the same level of competition Lesnar did. But unlike Lesnar, Lashley isn’t retired, he’s still actively fighting. It is worth noting, and praising, that Lashley while actively competing for TNA as their World Champion, fought and won a fight in Bellator MMA. That is something that Brock Lesnar never did and never will do. It is a little caveat, but a legitimate one. Lashley’s in ring pro wrestling skills, have also improved dramatically. He tells a story with his facial features and plays to his strengths. TNA to their credit, has booked him as well as someone like Lashley can be booked. In an era where TNA can’t seem to do anything right, they have done very little if anything wrong with Lashley since he returned to the company at Lockdown in March. Since Lashley apparently doesn’t know how to talk arrogantly, TNA gave him a mouthpiece/hype man in MVP. That was a double win as MVP was nursing a broken ankle at the time and needed something to do on camera. TNA killed two birds with one stone and now, it is almost impossible to think of or book Lashley without MVP as his version of Paul Heyman. TNA has booked Lashley against technically proficient opponents who are able to bump for Bobby as well as mask his deficiencies in the same model of The Undertaker’s last five WrestleMania opponents. 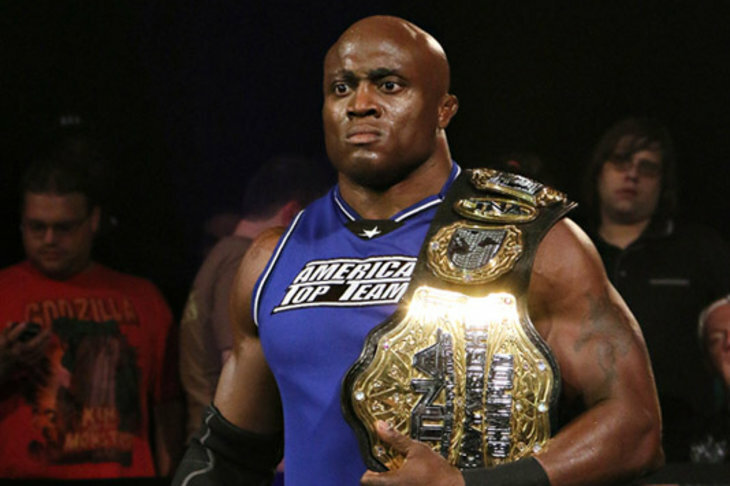 Lashley’s matches against Samoa Joe (twice), Eric Young, Austin Aries, and Bobby Roode have all been American style, pro wrestling/sports entertainment heavyweight style matches. Fans of wrestling both pre PG and pre Attitude eras would have an appreciation of those matches. Storytelling, selling, submissions, hot crowds, manuever exchanges, a high spot or two, go home. TNA has also booked him as an unstoppable monster. When he inevitably loses the world title, it will be a big deal, at least by TNA standards. Lashley has come along way since his unwatchable runs as United States and ECW Champions in WWE. He is becoming the type of talent that Vince McMahon likely envisioned him as when he tryed to ram Lashley down the fan’s throats for almost two full years before releasing him after main eventing a pay per view with John Cena. Yeah, you read that right. Lashley has also become a face in the argument of the legitimacy of pro wrestlers as real athletes and genuine tough guys instead of phony actors. Actively holding the world title for the #2 pro wrestling company and actively winning fights for the #2 mixed martial arts promotion is a bigger deal in both sports than many seem to want to give it credit for. It’s understandable, Lashley’s work in WWE was just awful. But his work in his first run in TNA in 2009 was good. His matches against Rhino, Samoa Joe, and Scott Steiner are all worth looking up on You Tube. He then spent four years bouncing between independent pro wrestling and mixed martial arts. Now he’s a top guy in the #2 promotion for both sports. What’s next? Lashley isn’t that old. He may not just be getting started, but he certainly isn’t finished. It’s hard for me to believe that a body guy could be such an inspirational figure. But in the year 2014 in the worlds of pro wrestling and mixed martial arts, there is no better story than the renaissance of Bobby Lashley. What is #Alibaba? And How Did It Become the Biggest IPO Ever?